Vitiligo refers to the loss of skin colour in patches occurs due to the death of the cells that produce melanin. Vitiligo causes include genetics, sunburn, stress, exposure to chemicals and virus. The major symptom is the presence of pale patchy areas. 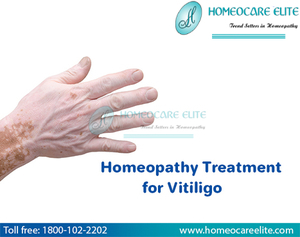 Homeopathy treatment for vitiligo shows effective results the treatment duration depends on the severity.